I used to remove the rust of the bicycle. liked it. To remove the rust of the bicycle, It was optimal. I also want to buy. This review is about item#34697126. It can not be said that this is not necessary to remove the strong rust of the bicycle. This review is about item#34697117. It is used to clean the threads of car harmonics. It is saved because it is high quality even if you think about the price. It is used for dirt removal etc of the metal part, but I want you to densify the flock a little more. Also, it is easy to bend. Before lower coating of warehouses and company cars, Keren work is done, but a wire brush that can be used is mandatory. It is such use. I am using it to check the chassis number which is engraved mainly in the frame of a large car, but it is really nice because the wire is solid and easy to use and the price is also cheap. The product itself is satisfactory. Because there were cheap products at mass retailers with similar items It is a little disappointing. There is a possibility of air escape unless you carefully polish the tire fitting part of the wheel. The wire brush polished and scraped off and dropped off, consumable supplies, cheap and greatly saved. Quality is also good, it is handy because it can be purchased at a relatively low price. It is used for slag removal after welding operation. Because it is 4 lines, it will be cleaner than other brand name brand products. It is recommended because there are fewer points than major manufacturers. It is a perfect product for paint peeling where the wire is stiff and used for rust removal and floating up. Because it is a consumable item, the price is cheap. It is the most expensive item so it is cheap. It feels a bit softer than other manufacturers, but you can use it normally. For rust removal, I use it for pretty much anything. Although it uses a brass stuff to be scratched indeed (this is also a monoterous brand) it falls on most things by this. Because it is cheap, it is used quite roughly. It is already the fourth one, I still use it, the next is a bargain sale plan. I definitely recommend it. It is neither possible nor impossible, I would like to judge from now on how much durability it is. Low price and high quality. There is no problem at all. It was bargain. The brush part drops hard and stubborn rust like a wire. It is very handy to do it. Easy to use and affordable. I will try to use some extent durably afterwards. 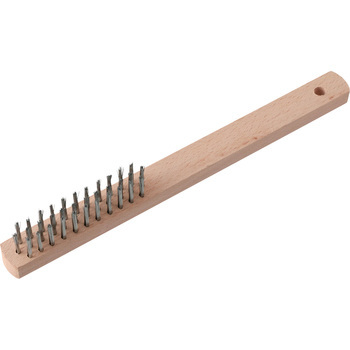 I think that it is different from the original use, but I use it to take out the dust that accumulated in the hair part of the freely available broom. I am satisfied because I can pierce deep into my hair with a firm wire and take out dust.